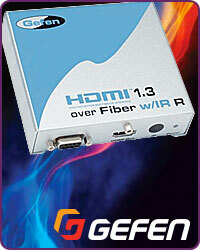 GEFEN Products at HAVE Inc! Gefen started in the computer connectivity arena in 1995, when marketing a line of KVM (keyboard, video and mouse) computer peripheral extenders known as the ex-tend-it Professional Series. Their work in the field led them to early adoption of the digital interfaces that would soon develop into HDTV. Today, they are a leading provider of innovative audio, video and computer signal processing solutions for commercial and prosumer applications. Their history of practical innovation has paved the way for an ever-increasing line of intuitive connectivity products and solutions that bridge the gap between rapidly advancing technology and real-world applications. If there is an Gefen product you need that you don't see here in our store, just send us an e-mail or call us at (888) 999-4283 and we'll get it for you!